The two teams shared two common opponents that year: Mississippi and Southern California. Alabama DEFEATED BOTH of those common opponents (Ole Miss, 34-13 and USC, 21-20), and lost only to eventual #10 Nebraska by a touchdown. Notre Dame LOST to one of the common opponents. The Irish beat USC soundly, 49-19, after the Trojans had already been deflated by the loss to UA, but the SEC’s own Ole Miss handed ND its only loss of the season. Notre Dame did whip top-ranked Texas in its bowl game, but Alabama completely demoralized the #8 Ohio State Buckeyes, whose only previous losses came to two teams ranked in the top-five. 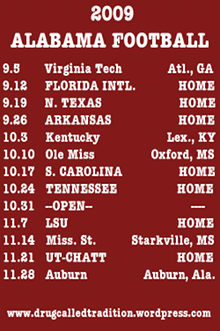 (4) ‘Bama played an overall tougher schedule than Notre Dame. Of course, the evidence is overwhelmingly in favor of Alabama, and there are dozens of more facts not listed here that damaged ND’s case, but the voters chose to ignore these facts. Not a drop of research on this, but it was probably the only time the highest-ranked team in the nation to win its game in any given week was denied taking over the spots of the teams formerly ranked higher, even when the win was such a resounding one, such as Alabama’s 35-6 clobbering of OSU.